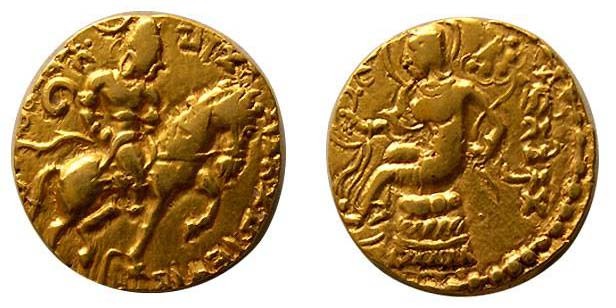 "Samudragupta (circa 335 - 380 AD) AV Stater. 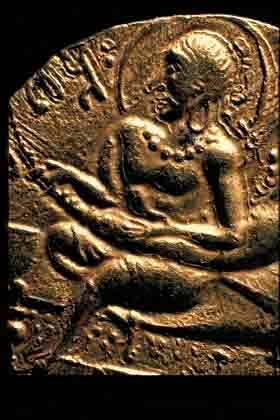 Obverse: King standing left, holding long sceptre in left hand, right hand lowered to an altar; Garuda standard to left. In Brahmi: 'Samudra' in right field; and partial marginal legend. 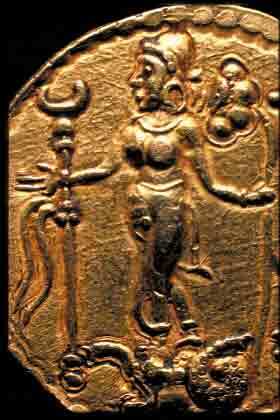 Reverse: Goddess Lakshmi enthroned facing, holding cornucopia; symbol to left. In Brahmi: 'Parakramah' to right." "GUPTA KINGS of INDIA. Samudragupta. 335-380 AD. 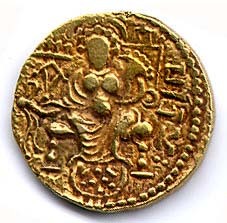 Gold Dinar (7.47 gm; 20 mm). Standard Type. 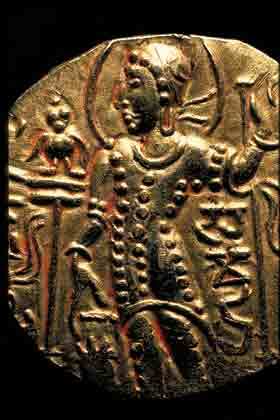 Samudragupta, nimbate, standing left, holding standard; Garuda standard behind / The goddess Laksmi seated facing on throne, holding diadem." "King bare-headed, wearing only waist cloth and jewelary, seated on couch with sloped back, playing the vina (Indian lyre), Samudragupta, gold dinar, obverse, Ca.355-380, The Skanhe Collection, ACSAA." "Circa 335-380 AD. AV Dinar (7.62 gm; 20 mm). Ashvamedha type. Sacrificial horse standing left before pedestal with filleted yupa post, from which a banner flutters; "si" on footstool below / The queen, not nimbate, standing left on lotus-form mat, holding chouri (fly whisk) and cloth, suchi (filleted spear) before her. Brahmi legend right: Asvamedhaparakrama." "King standing, wearing a kushan style coat and trousers, holding a tall standard in his left hand, sacrificing over an altar. In the field to his right is his garudadhvaja. 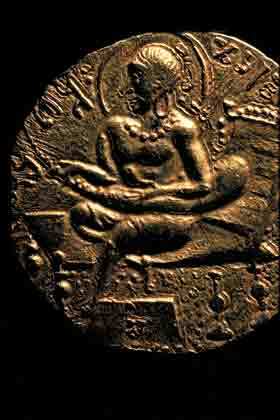 Samudragupta, gold dinar, Ca.355-380, The Skanhe Collection, ACSAA." 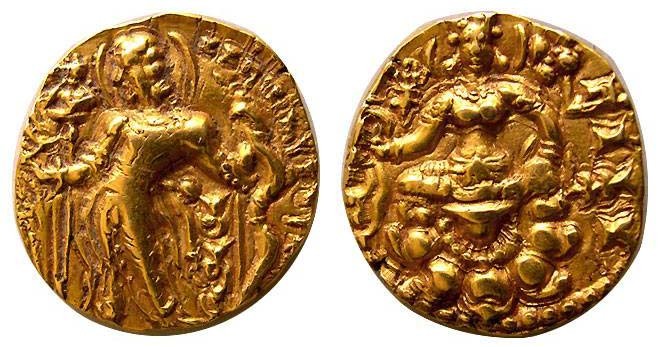 "Lakshmi standing on a makara (elephant headed fish) to the left, holding long stemmed lotus in left hand, her right hand extended to her side, Samudragupta, gold dinar, Ca.355-380, The Skanhe Collection, ACSAA." "GUPTA KINGS of INDIA. 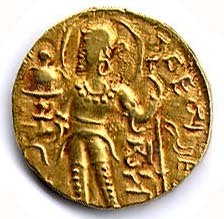 Chandragupta II. 380-414 AD. Gold Dinar (9.07 gm; 20 mm). Chandragupta standing left, holding arrow and bow; Garuda standard behind / The goddess Laksmi seated facing, holding diadem and lotus." 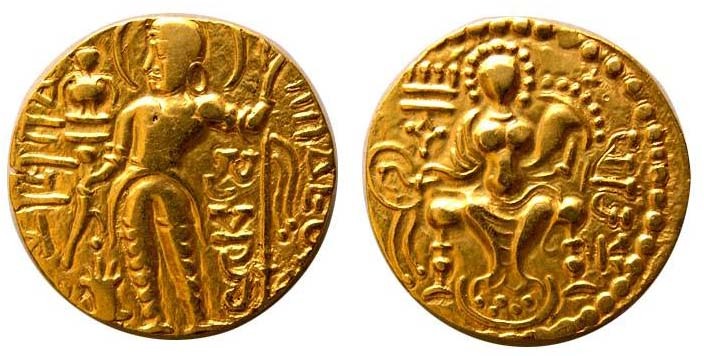 "Chandra Gupta II 375-414 AD. Gold Dinar (7.67 gm; 18 mm). Chandragupta riding horse right, he holds a bow above the horse's head and a whip by his side / The goddess Lakshmi, nimbate, seated left on wicker stool, holding diadem and lotus.."